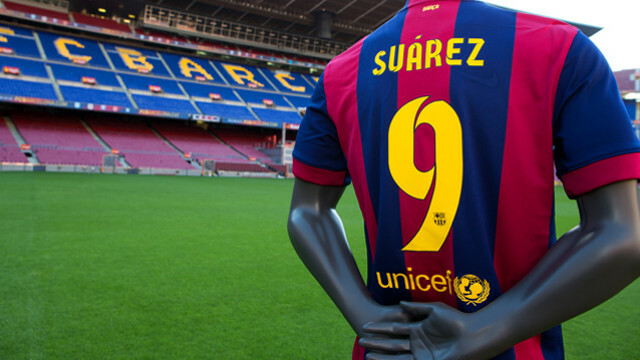 Luis Suárez will wear number ‘9’ in the Barça 2014/15 squad, a number he inherits from Alexis Sánchez, its owner for the last three seasons. Others that have worn the famous shirt include Bojan, Ibrahimovic, Eto’o, Kluivert, Anderson, Ronaldo and Kodro. Luis Suárez means Barça have a classic goal-getter – the kind of player whose primary objective is to put the ball in the back of the net. There have been 18 others in the last two decades. The most recent example was David Villa, signed in 2010, although in three seasons at the Camp Nou he was usually played out wide. Since 1993, Barça has been home to some of the finest strikers in the world. We can start with Brazil’s Romário, signed from PSV Eindhoven, the same club that supplied his compatriot Ronaldo three years after. Other world class centre-forwards have included Kluivert (98-04), Henry, who also played on the left, (07-10) and Ibrahimovic (09/10). And then there have been the super-subs, such as Pizzi (96-98) and Larsson (04-06), who both won the hearts of the Barça faithful, as did Samuel Eto’o, one of the club’s top goalscorers in recent times. Sony Anderson and Javier Saviola also found the target plenty of times while they were here, while those who perhaps didn’t deliver quite as well as expected have included Kodro, Dani, Alfonso, Maxi López and Gudjohnsen. Luis Suárez becomes the seventh South American striker that Barça have had in the last two decades. His predecessors were Romário, Ronaldo, Pizzi, Anderson, Saviola and Maxi López. Previous Previous post: Suárez is the fifth Golden Boot winner to join FC Barcelona. But who were the other four?